We have reviewed a large selection of Noctua products over the years, and we have become very familiar with their distinctive design for cooling fans. The color scheme used can not be confused with any other brand, and in action the performance is hard to match, too. Things changed over at Noctua recently, and with the launch of two new lines of fans, comes two new color schemes and a bunch of feature changes. The promotional image above shows off a pair of Noctua's industrialPPC fans, wher the PPC stands for Protected Performance Cooling. These fans offer a black fan body and feature-wise among other things they offer dust/water resistance, and 3-phase motors for reduced power consumption and smoother/quieter operation. The other line up is named redux, and these grey colored fans offer a more entry level, budget friendly take on the Noctua fan that still offers all of the high end features people have come to expect from Noctua. 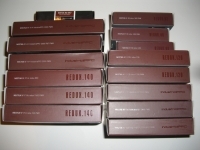 The image below shows all of the fans sent over by Noctua... fourteen in all, plus a box of LNA cables. There are eight redux fans and six industrialPPC fans to look over, and considering that the redux line has thirteen fans total and the industrialPPC line has eight fans total, we have received a fairly comprehensive sampling of what they have to offer. Not all of the fans will be thoroughly tested, as we will keep some in like new condition for a give away running at the time of the review's release. 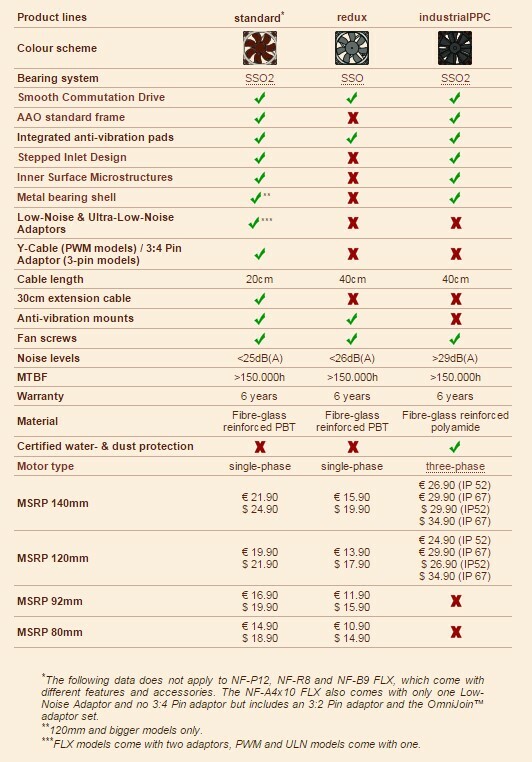 To cover all of the differences between Noctua's fans, the following list was copied from their website. We see how the redux and industrialPPC fans compare to what they now call their standard fans. In addition to all of the performance related data, you can also see a comparison of MSRPs, where you can see that while the redux line is definitely the most budget friendly option, they still aren't cheap. On the other hand, the industrialPPC line's premium features come at an even more premium price.